Quantum of the Seas is backing away from the dock and should pass the barrier into the Ems at just about 2:30pm as called for in the revised plan. That puts arrival at Eemshaven at approximately 4:30am on Tuesday (10:30pm on Monday Eastern US time). Weather conditions along the Ems have improved and Meyer Werft says they plan to begin the river conveyance of Quantum of the Seas at approximately 2:30pm (8:30am Eastern time in the US). Meyer Werft has now delayed the river conveyance of Quantum of the Seas until at least Monday due to possible strong winds on Sunday afternoon and evening. A decision and announcement will be made at noon on Monday (6am Eastern time in the US). Meyer Werft said this morning that the conveyance of Quantum of the Seas will be delayed due to weather conditions. It had originally been scheduled to begin at approximately 2pm on Sunday (8am, Eastern time in the US). Later times on Sunday are now being considered, but it could also be delayed until a later date. Meyer said a decision will be made at approximately noon on Sunday (6am, Eastern time in the US). The conveyance will take the ship down the Ems river to the sea. Photo courtesy of Meyer Werft. All rights reserved. May not be copied or used without permission. 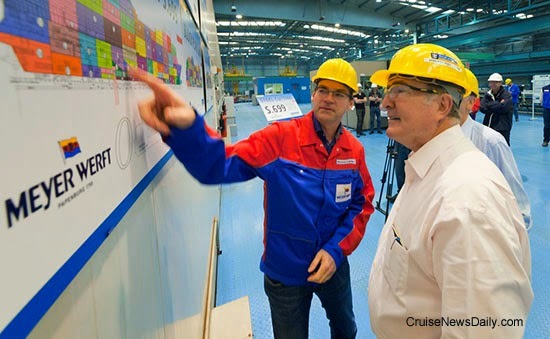 Meyer Werft in Papenburg is a very busy place these days with several ships already under construction, and yesterday cutting steel for another. You wouldn’t think they’d have room to build any more - but they do. 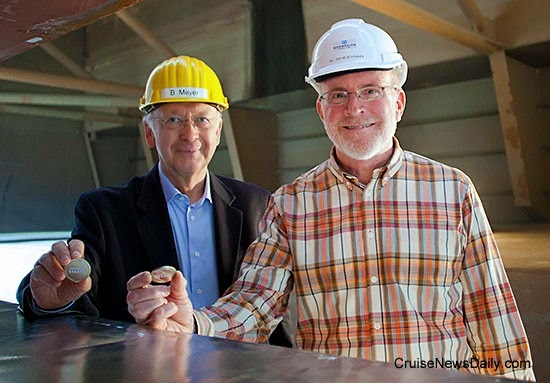 The yard laid the keel for Norwegian Escape today. 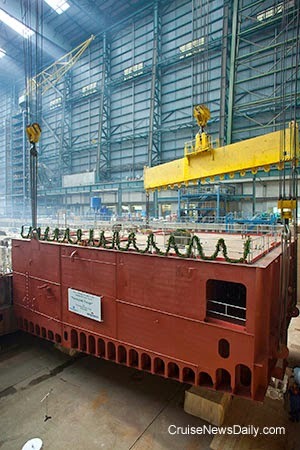 It will be the first of a new class of ships to be delivered in October 2015. Meyer Werft received permission from Germany’s antitrust authority and has finalized the purchase of 70% of the STX yard at Turku, Finland. The Finnish government took the other 30% by way of the Finnish Industry Investment Ltd, an investment company fully owned by the Finnish government. The yard will now be called Meyer Turku Oy. At the same time the yard also finalized additional orders from TUI. The Royal Caribbean Blog is reporting that Royal Caribbean is in the process of trademarking several potential ship names. The complete article appears in the September 19 edition of Cruise News Daily. Bernard Meyer (left) and Kevin Sheehan show the coins placed beneath the keel for luck. There was obviously a miscommunication about Freestyle Friday being canceled. 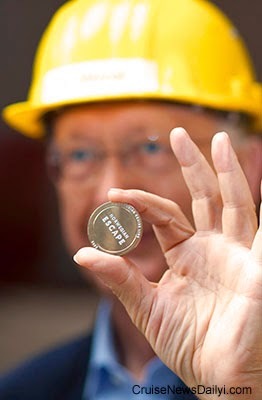 Bernard Meyer shows off the detail on one of the coins. 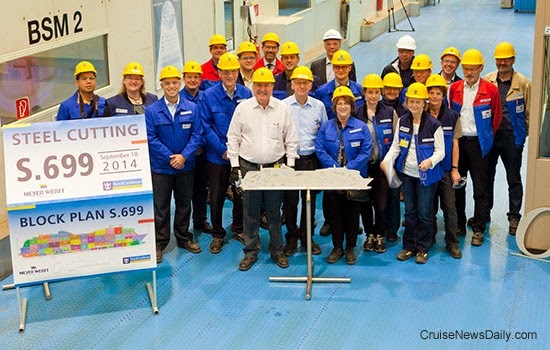 Meyer Werft cut the first steel today for the third Quantum-class ship on order. Royal Caribbean took the opportunity to announce they will name the ship Ovation of the Seas. Who says there’s nowhere new to go? Silversea just released their 2016 programs and among their eight ships they will visit 107 new ports out of their 845 port calls during the year. 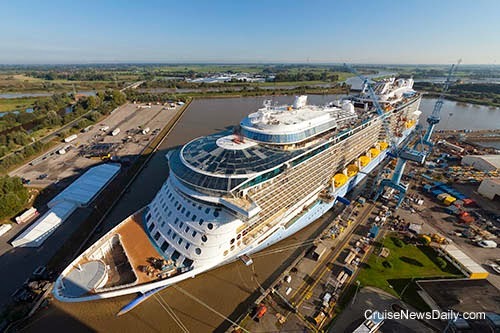 Meyer Werft said today that Quantum of the Seas will leave their Papenburg yard on Sunday afternoon to begin its passage down the Ems River to the sea. The Port of San Francisco opened their new $100 million cruise terminal today with the arrival of the first ship, Crown Princess. Instead of fireworks and streamers, it was just the passengers and the ship. 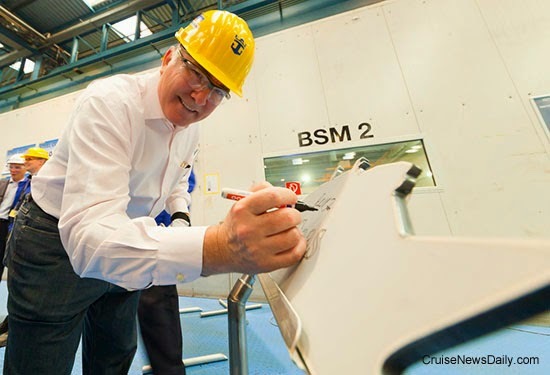 Meyer Werft cut the first steel today for the third Quantum-class ship on order. Royal Caribbean took the opportunity to announce they will name the ship Ovation of the Seas. The event took place today at Meyer Werft in Papenberg, Germany. The complete story appeared in the September 18 edition of Cruise News Daily. 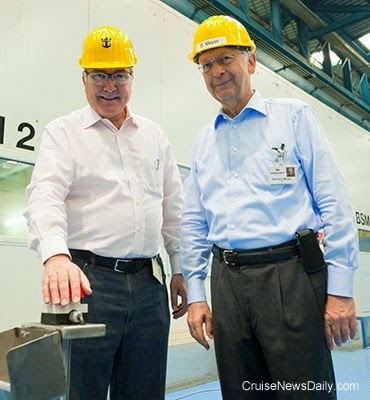 Richard Fain (left) and Bernard Meyer push the button to cut the first steel. The eventual location of the steel cut today is pointed out to Richard Fain. Pizza is synonymous with Italy, and because it is so much a part of the culture, Costa strives to keep theirs at the top of the industry. With the recent enhancements to Costa neoRomantica came a new pizzeria and enhanced pizza. It has been so successful, Costa has carried the product out to other ships in the fleet. Passengers aboard Norwegian Pearl’s Alaskan cruise last week were notified that a crew member “likely has a case of measles” (rubeola). The eyes of Texas may be upon you, but as we reported in December, the State of Texas is getting their hand deeper into the pockets of cruise passengers if they sail into either of the state’s cruise ports. Passengers have been surprised since the first of the year when returning and paying a state tax on their liquor and cigarettes at Galveston. Now the state is ready to "surprise" passengers at Houston next month. Carnival Cruise Lines renewed their most unique sales tool for another year, but it also seems to be one of their best kept secrets. The Great Vacation Guarantee has been extended through 2015. Photo courtesy of Royal Caribbean. All rights reserved. May not be copied or used without permission. On 1 May 2004, Cunard flagship status passed from Queen Elizabeth 2 to Queen Mary 2 and the company sought a physical symbol to represent flagship status. Enter the Boston Cup! In a moving ceremony, QE2's Captain Ian McNaught handed the Cup to Queen Mary 2's Commodore Ron Warwick, and later that day attending guests, including Deputy Prime Minister John Prescott, transferred by boat to the new flagship for lunch. After lunch they gathered at the stern of Queen Mary 2 and enjoyed the traditional British hymns and anthems waiting for QE2 to sail past. When she emerged from the mist, the music was dramatically replaced with “Isn't She Lovely” by Stevie Wonder. Nothing more appropriate could have been played and there was not a dry eye on those aft decks – even those of the Deputy Prime Minister. 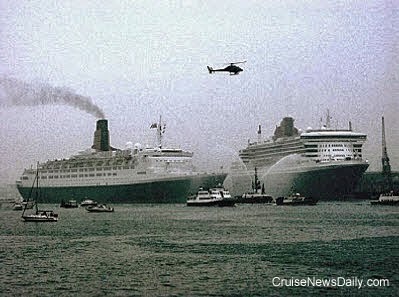 Later that night, with the Boston Cup on board, Queen Mary 2 sailed for the first time as Cunard flagship. In early 1840, Boston was preparing for the mid-July arrival of the first transatlantic mail ship, Britannia. The East Boston Company had spent about $40,000 to build a dock for Britannia and her sisters. An elaborate festival to welcome the ship and company founder Samuel Cunard was planned by a committee of Boston merchants who appreciated the vast difference the ship would make to the commercial world as a whole and to Boston in particular. Samuel Cunard would be the hero of the occasion and an honoured guest. The merchants commissioned a magnificent silver cup, which was made by the city's most outstanding silversmith, Obadiah Rich (1809 - 1888) for Lows, Ball & Company. Liverpool Eng. - Halifax N.S. Subscriptions were taken for a public dinner in Samuel Cunard's honour that was planned for his arrival in Boston aboard Britannia. An enormous canvas pavilion or tent was spread from the roof on the south side of the East Boston Hotel over an area large enough to contain tables for two thousand guests. The long balconies on the south side of the hotel could be used by the ladies, who could not otherwise have been accommodated. Columns supporting the tent were wreathed with evergreens and bouquets of flowers. In the middle, an arch was erected with the single word “Cunard” inscribed on it in gold. To the right was a painted canvas of the American eagle and the name Fulton and to the left, another with the British arms and the name Watt, commemorating the importance of the invention of the steam engine to the event at hand. 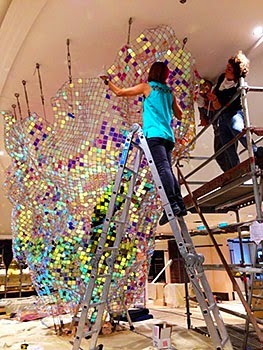 People came by day and night to inspect the pavilion and “gape in astonishment” at the size and beauty of the banners and emblems embellishing it. Samuel Cunard himself was to have spoken at the public dinner, but he was a shy and diffident man. He rose and, barely audible, thanked the crowd but said that as he was unaccustomed to public speaking, he wouldn’t. And he sat down. He was then presented with the Boston Cup but had to return it to Lows, Ball & Company straight after the dinner as it wasn’t quite finished. When it was re-presented, or whether Samuel Cunard ever saw it again, is unknown. 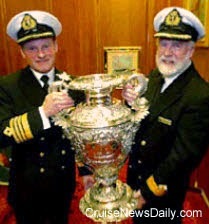 In 1967 the Cunard Deputy Chairman “found” the Boston Cup in an antiques shop in Maryland (without its lid) and it was re-presented to Cunard and placed aboard Franconia when she made the first Cunard visit to Boston since World War II, to bring it to the U.K. 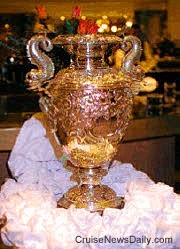 In the mid 1970s, the Cup was placed on display aboard QE2 and remained there until it was presented to Queen Mary 2 in May 2004. The Boston Cup is surely one of Cunard’s greatest treasures and is shrouded in a great deal of mystery. Within a short period of time, Cunard had boosted the economy of the eastern seaboard, and the company's relentlessly reliable connection to Britain made the distant so much nearer. The service into Boston increased the city’s prosperity, its population soared by 39,000 between 1840 and 1845, its trade doubled, the city's foreign business doubled, and to Boston came new workers and great prosperity. In ten years Cunard paid the amazing sum of $10 million in dues to United States Customs. What Samuel Cunard did for Boston, Boston never forgot when, on 30 January 1844, the people awoke to a strange and awesome sight. The entire Boston harbour was a solid sea of ice, and wedged in tight, helpless and unable to turn a paddle, was Britannia, "Boston's most beloved ship." Her sailing date was only three days away and, with 65 passengers booked, she was carrying the all-important mail. The Admiralty Contract which Samuel Cunard had bravely taken on had stipulated penalties of £15,000 for each missed sailing and £500 for every 12-hour delay. Four late arrivals, statistically possible with untried technology on the Atlantic, would have completely wiped out the annual £55,000 subsidy. A great wave of sympathy and friendliness toward Britannia's plight "swept the people." Boston Mayor Martin Brimmer called on the Selectmen and the Merchants to a hurried Council at the Exchange. Mayor Brimmer declared money had to be raised to cut Britannia out of the ice: "There must be no expense to Mr. Cunard." A total of $3,000 was raised immediately, and at dawn on 1 February 1,500 men were hard at work with horses and ploughs, picks and axes and apparatus of every sort. Thousands turned out on the ice on skates to watch and cheer, and there were horse-sledges and boats on runners and tents for refreshments. The third day "saw the miracle performed" – the people of Boston had cut a great canal in the ice, 10 miles long and 200 feet wide. Britannia was free. Samuel Cunard offered $1,500 toward the cost, but the city rejected his offer. Boston and Cunard will always share a special relationship, and the Boston Cup will sail on future Cunard flagships symbolising this link forever. Photos courtesy of Cunard Line. All rights reserved. May not be copied or used without permission. (Ft. Lauderdale, FL -- September 16, 2014) For travelers seeking exclusive journeys to landmark destinations as well as the world's most exotic lands, tiny isles, and less-traveled waterways, Silversea is offering an unprecedented array of voyage options in 2016, all available for reservation today. Venetian World Cruise: Departing Fort Lauderdale on January 5, this 115-day sailing will visit 51 destinations in 31 countries. It will follow a westward path through the Panama Canal to South America and the Pacific. Guests will explore the island paradises of the South Seas, including Easter Island, Pitcairn Island, Tahiti, and Bora Bora before sailing to the most desirable destinations of New Zealand, Australia, and Asia, including vibrant Hong Kong and Singapore, the enticing resorts of Bali and Phuket, and mysterious Myanmar. The odyssey will continue to exotic India, Arabia, and timeless Mediterranean hideaways before concluding with two nights in magnificent Venice. Circle South America: Silver Spirit departs January 15 on a 66-day roundtrip Grand Voyage from Fort Lauderdale. Highlights include a crossing of the Panama Canal, two days cruising Chile's majestic fjords, a three-day stopover in Rio de Janeiro during Carnival, plus multi-day calls in Buenos Aires and Callao (gateway to Lima and Machu Picchu). South Africa: Silver Cloud offers a trio of 10-day voyages showcasing South Africa's east coast with convenient roundtrip departures from Cape Town in February. The sailings (1603 - 1605) include calls in Port Elizabeth, Durban, East London, Maputo, and an overnight stay in Richards Bay. After a few years' absence, Silver Whisper returns to the North Cape with a 14-day roundtrip sailing from Copenhagen on June 17. Voyage 4613 spotlights some of Norways's most breathtaking scenery and includes a stop in the Arctic village of Honningsvag, gateway to the North Cape, Europe's northernmost point. Travelers to this region may observe the traditional customs and lifestyle of the indigenous Sami people and spot reindeer during the summer months. Silver Spirit's Voyage 5613, sailing from Barcelona to Rome, will overnight in Cannes on May 25, during the city's famous film festival, and also overnight in Monte Carlo on May 28, during the Grand Prix. Silver Wind will sail the Thames River to dock near (or depart from) Tower Bridge in the heart of historic London on six voyages (2617 - 2622) -- a journey most cruise ships are too large to navigate. Alaska: From May through September, Silver Shadow returns to explore the stunning natural wonders of Alaska on 17 seven-day voyages between Seward and Vancouver. Myanmar: In addition to the Venetian World Cruise, three Silver Shadow voyages (3604, 3609 and 3633) feature multi-day stopovers in Myanmar, where guests can explore its famous golden pagodas and ancient temples in depth. "Traditional cruise enthusiasts will find our five ocean-going ships offer a diverse array of travel choices, including itineraries with multi-day calls and overnight stays, many of which can be combined without repeating ports to create unique and enriching travel experiences," said Kristian Anderson, Silversea's senior vice president and general manager for the Americas. "And for thrill-seeking adventure travelers, our expedition cruises offer unsurpassed opportunities to discover the amazing natural and cultural treasures of the world's most remote regions." The line's three expedition ships, Silver Explorer, Silver Discoverer, and Silver Galapagos, will collectively explore over 500 destinations on 95 expedition cruises. Included among 88 inaugural calls are Gough Island, St. Helena; Lizard Island, Australia; Aldabra Atoll, Seychelles; Ko Phra Thong, Thailand; and South Cinque Island, Andaman Archipelago. Silver Explorer's schedule retains its ever-popular expedition cruises to Antarctica, South and Central America, the British Isles, Northern Canada, Greenland, and Arctic Norway. New and noteworthy itineraries include a 12-day expedition to the White Sea sailing roundtrip from Tromso on June 11 (Voyage 7612), and an 18-day journey (7619) focused on Greenland and the Canadian Arctic, sailing roundtrip from Kangerlussuaq on August 22. Silver Discoverer's six expedition cruises along Australia's Kimberley Coast from March to May highlight an exotic program that encompasses Africa, New Zealand, Indonesia, Melanesia, Micronesia, Russian Far East, and remote Alaska. On the schedule is a new 15-day, Phuket-to-Male sailing (9626) departing December 2 to explore Myanmar, India, Sri Lanka, and the Maldives. Plus, on December 17, the ship departs Male on a new 17-day expedition (9627) to the Seychelles, Maldives, Mozambique, and Tanzania. Highlighting this voyage is an inaugural visit to Aldabra, an amazing raised coral atoll that has been designated a UNESCO World Heritage Site. And Silver Galapagos will again operate year-round voyages exploring the pristine and biologically diverse islands of the Galápagos. Please visit www.silversea.com for additional details on the 2016 voyage collection. Gabriele Baroni New Communication Director of Costa Crociere S.p.A.
Genoa, September 16, 2014 - With effect from September 15, Gabriele Baroni is joining Costa Crociere S.p.A. in the position of Communication Director and will be reporting to the Vice President Communication & Sustainability Hansjoerg Kunze. Gabriele will be in charge of developing and executing media relations strategies and tactics in support of the Costa brand communication as well as managing the Internal Communication activities. In his new role Baroni will be in charge for Corporate Communication, Press Office, Internal Communication as well as the communication coordination of the International markets. “It’s a nice pleasure for me to welcome Gabriele onboard. With the appointment of Baroni the Costa Crociere Communication team can count on a group of passionate professionals who will be able to take advantage of all the challenges and continue with the process of opening the dialogue and relationships building with all the relevant stakeholders” - stated Vice President Communication & Sustainability Hansjoerg Kunze. Gabriele Baroni 44 joins Costa Crociere from the public relations and communications firm Burson-Marsteller, where he started in 2001. He developed considerable expertise in the Corporate Communication area, Media Relations, Corporate Reputation, Stakeholder Engagement programs and Crisis Management Plans. Since February 2010 he was Burson-Marsteller’s Director of the Financial, Energy & Crisis practice. Over the last several sailings in Australia, Sea Princess hasn’t been sailing up to normal cruising speeds while work was done on its propulsion system while the ship was underway. Holland America Line said today they would name their next ship Koningsdam, and the name will blend the old with the new. Beginning this fall aboard Princess Cruises, to really fit in, you don’t have to run out and buy a Princess T-shirt anymore. You can sit in any lounge and just sip (or guzzle) a frosty Seawitch. Princess Cruises will have their own craft beer. The brew will debut aboard Regal Princess when it arrives in the Caribbean, and then flow out to the rest of the fleet in early 2015. MIAMI (September 15, 2014) – Sarah Beth Reno – a 27-year travel industry veteran – has been named vice president of entertainment for Miami-based Carnival Cruise Lines, the world’s largest cruise operator. In this capacity, Reno is responsible for all aspects of entertainment and programming for Carnival’s 24-ship fleet, including production revues, live musical performances, comedy clubs, guest activities, cruise directors/entertainment staff, and youth programs. She will also focus on developing and bringing new entertainment concepts to the brand. Reno starts at Carnival on October 6, reporting to Mark Tamis, Carnival’s senior vice president of guest operations. “Entertainment is a key component of the ‘Fun Ship’ vacation experience and we’re fortunate to have someone of Sarah’s caliber to oversee the many wide ranging entertainment offerings that have made Carnival a leader in this area,” said Tamis. Prior to joining Carnival, Reno spent 19 years at Miami Beach-based Onboard Media, a leading provider of integrated media solutions to the global cruise and travel industries, including the past three years as president. During her career at Onboard Media, she also held a number of other management positions, including vice president of operations, associate vice president port shopping programs and operations manager. Reno also spent two years as director of recreation and social activities at The Plantation Club in Villa Rica, Ga.; three years at the Leiv Eiriksson Center, a non-profit organization offering social and educational programs for crew members employed on cruise and cargo ships based at PortMiami; and four years as youth coordinator, cruise staff member and assistant cruise director at Norwegian Cruise Line. A resident of Coconut Grove, Fla., Reno earned a bachelor’s of science degree in recreational management from the University of Illinois at Urbana-Champaign.